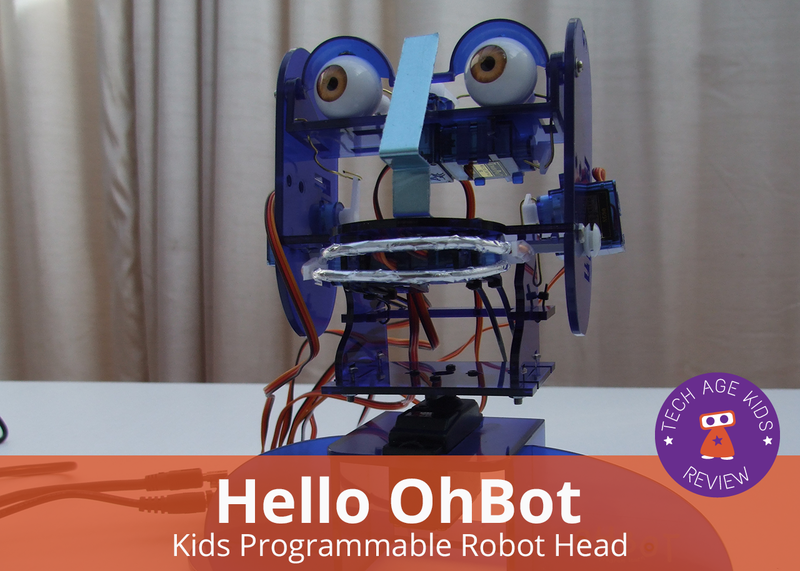 OhBot is a robot head that can be programmed with a Scratch-like graphical language. OhBot supports speech generation and speech recognition. The new version 2 model has 7 servos which allows for lots of expressivity. We went for the build-it-yourself option on Kickstarter so we'll take a look at the assembly process here as well as using an OhBot. You can buy a ready built OhBot though if you don't want to make your own. 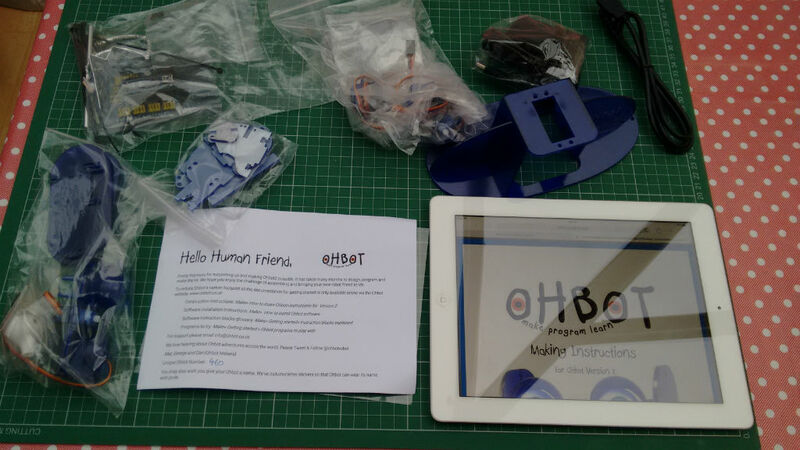 It took me about 3 hours to assemble OhBot from a kit, tune it up and try out the software. It could have been quicker but I was checking stuff very carefully to make sure I didn't make a mistake. The instructions were pretty good but I did get a bit confused because you also get extra screws that come with the servos but aren't used in the construction. The large servo that controls the head was a very tight fit but mostly it went together smoothly. I was really nervous about some of the snap together pieces as they look brittle and fragile but I didn't break any of them. However, I quickly broke the included acrylic spanner so I'd recommend using real tools! Attaching parts to some of the servos was really fiddly but with help from my nine year old in one case and my partner in another, it all went together. A capable teen would probably do a much better job that me but it's not a task for young kids. You get the servos into the correct position before attaching the parts they control and that was straightforward. I was expecting it to be really tricky to get everything tuned up with the correct range of movement but that bit was simple. Building the robot really helped me understand how OhBot works and means I'm much more likely to be able to fix it if anything comes loose in future. Once OhBot is setup it loads a demo program which uses speech and tries out all of the servos so you can see whether everything is correctly. I really didn't trust that I'd assembled it correctly, but to my surprise it worked pretty well. It was only the Eye Tilt that required a bit a fiddling with the wire that attaches to the servo to get the correct range of movement. We did find that the cable to the power adapter is very short which was a bit of a pain. The OhBot software is Scratch-like but not based on the actual Scratch software. As well as the motor control blocks you get an interface to Windows speech recognition and speech generation and there's also basic face detection via the camera. There's a really useful onscreen simulation of OhBot too. OhBot's mouth moves automatically when it speaks so you don't have to program that manually. You can control all the servos individually and they are helpfully named Head Nod, Eye Tilt, etc in the software rather than having obscure names. Each servo has a range of movement from 0 to 10 which is easy to understand. Any child who is familiar with Scratch will immediately be able to control OhBot. OhBot is a really nice change from driving floor robots around. There's lots of scope here for teaching kids about humanoid robots that you can interact with. It's a very different approach to driving things around and knocking things over! The first thing we did was get Archimedes to use his own name in the demo program instead of saying OhBot. 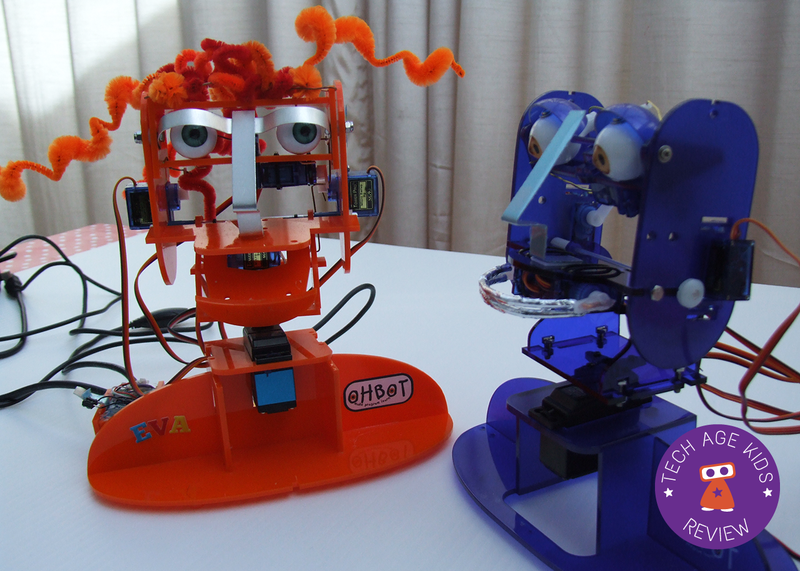 We think OhBot is great for maker families. 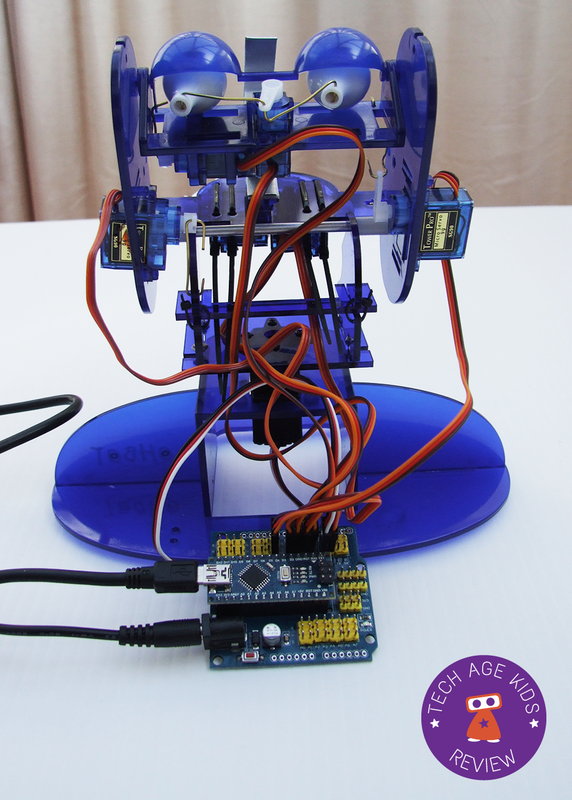 If you choose to build your own OhBot then you'll learn lots about servos and how they can be used to create different kinds of movement. Programming OhBot in its Scratch-like blocks based environment is straightforward for children. There's plenty of depth to explore, OhBot provides an accessible way in to artificial intelligence for kids and teens. I wouldn't recommend choosing a build-your-own version of OhBot to save money as it's quite time-consuming and some bits are quite fiddly. But if you want to get the experience of assembling a robot the its a great option for a joint parent-child project. OhBot does feel a little fragile for primary school use. I'd be worried about losing small parts or pieces getting broken. The need to be plugged in to a wall socket also makes things a bit tricky in a lot of classrooms. But provided you've got someone in school who is willing to keep the OhBots in good working order then they're a fabulous resource. I use floor robots a lot, but you do need more variety in the curriculum and OhBot will definitely appeal to children. It's a shame that OhBot isn't based on actual Scratch so you don't have access to all the features of Scratch, but the software does work well. And you can get a site license for the software with the simulation capability as long as the school has bought at least one OhBot. This is a fantastic option. OhBots would also be fabulous for older kids and teenagers. There's so much scope for exploring artificial intelligence and robotics in a very tangible way. We'll be featuring Archimedes in future projects. 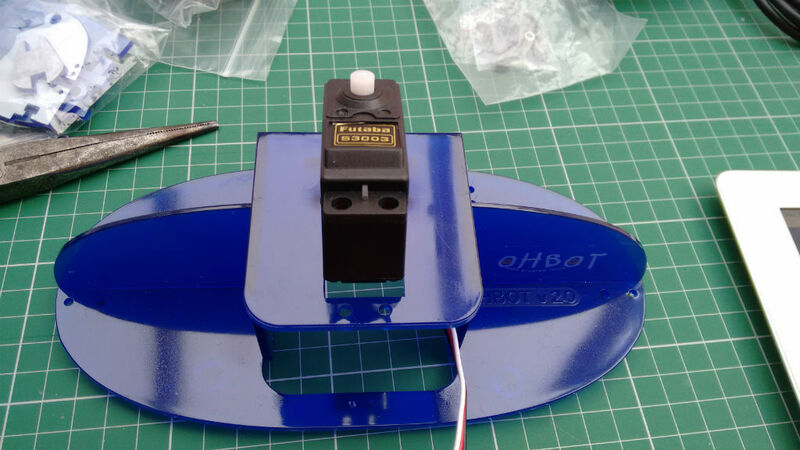 You can buy OhBot either assembled or in kit form on eBay (UK).